FOR RUNNING TIME CONTROLLED GAMES. The simplest and economic solution for charging time. For billiards, table tennis, bowls, tennis, darts, table for playing cards, golf, mini-golf, bowling, virtual machines, time controlled video-games, Internet rooms, solariums, saunas, air-hokey, bike, boat rental, etc.. It does not require an electrical power supply, thus eliminating the problems of an overload on the line or a sudden blackout. As a result, it may be set up practically anywhere. An internal lithium battery keeps the appliance on all the time for at least 8 years (average 10 years). The battery can be found in electronic shops. Suitable for all countries because the value of each unit can be programmed (monetary unit); it can be: 0.05 - 0.10 - 0.20 - 0.50 - 1 - 2 - 5 - 10 - 20 - 50 - 100. Two hourly rates which may be programmed from 10 to 500 clicks per hour. The second tariff may be employed for peak hours or for programmed from 0 to 15 units in the event that happen by pressing the TARIFF button. A start-game (or game-opening) charge, which may be programmed from zero to 15 units, in the event that a set game charge is required in addition to the hourly rate. A register totalling 99.999 units. The amount due is summed up when in the STOP position. This is in order to guarantee a good management during shifts of the personnel when the LCD 20 is in the count position and when money has not been collected yet. In order to prevent unwanted tampering, programming, zeroing of the totalizer and accessing the internal parts of the appliance, these operations can be carried out only using the INSTALLATION key. 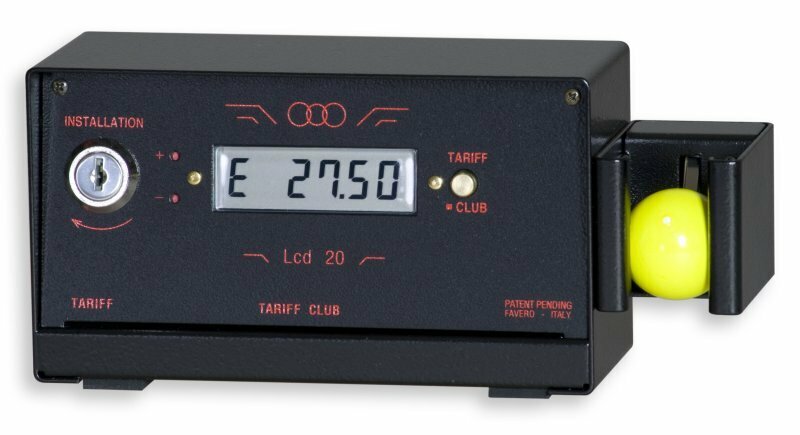 The flashing of the amount due indicates that the LCD 20 is in the counting position. Height of figures 12.7mm. Said figures can therefore be read from a distance. 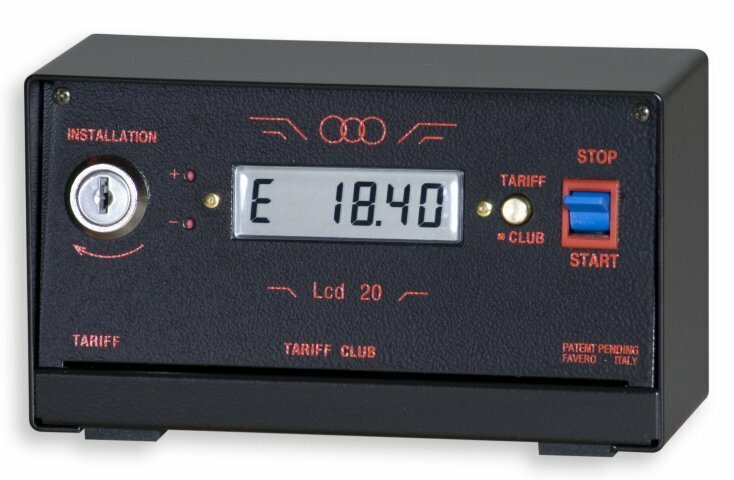 The simplicity of the electronics, isolation from the mains and its "zero" consumption make it highly reliable and can work at temperatures varying from 0°C to +50°C. Strong holder made of metal. Dimensions: width 18.6cm - height 10.6cm - depth 7.2 cm. Useful for taking advantage of peak hours, both daily and weekly. Three hourly rates can be programmed and they may alternate automatically on programmable hourly periods. In addition, the time is shown when no count is in progress. Size: 18,6x10,6x7,2cm. - Weight: 1.07kg. Size: 23,3x10,6x7,2cm. - Weight: 1.27kg.